Manufactured in Etats-Unis from Circa 1948 until 0. 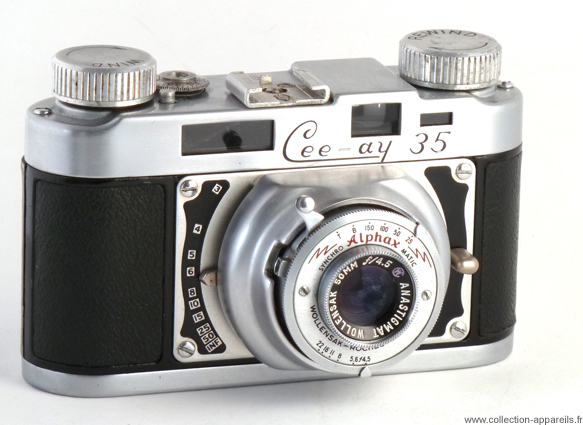 The Cee-Ay 35 was the last unit produced by the Camera Corporation of America in 1949. The Perfex range, slightly modified in 1944, was not a success and Cee-Ay 35 did not better. Molds and tooling were sold to Ciro who transformed this unit into a Ciro 35, before transferring fairly quickly, all at Graflex. The Cee-Ay 35 is rarer than its descendants. Their cover were bare brushed metal, the Ciro 35 have a metal stamped bare or painted black. The ergonomics of Cee-Ay 35 is much better than the first models of the brand, including a distance setting very smooth and accurate. The rangefinder viewfinder remains separated from the normal viewfinder. However, the opening and closing of the case are particularly uneasy. The Cee-Ay 35, aesthetically, is very successful. The combination of materials, shapes and colors is very well made.